I was on an investment panel at our Total Wealth Symposium in Las Vegas last month. My colleagues Jeff Yastine, Michael Carr, Paul Mampilly and Matt Badiali gave their responses on the topic of tariffs. They all did an excellent job covering the ins and outs of tariffs and the major impacts they will have. So, after they were done, I felt I had nothing else to add, at least on the big picture of tariffs. The next day, though, I sat down with Matt, and we were just chatting about the stock market. He brought tariffs up again, asking me how tariffs would have an impact on my investment strategies. My initial reaction somewhat surprised even me. But it’s exactly how I look at everything in the market. And if your goal is to make money, then it’s a mindset you must have as well. Tariffs have basically no impact on how my investment strategies perform. Especially to a natural resource investor like Matt, who has to worry about the details of the tariffs and how that’s going to impact the commodities he is watching. Because tariffs are a big deal. They can have long-lasting implications and affect broad market sectors. I studied for years to become a Chartered Market Technician (CMT). It’s the initials you see after my name. And when becoming a stock market technician, the hardest concept to grasp is that only one thing really matters — price. Not tariffs, a new president or any other major event. I simply follow prices, and the underlying indicators on price. By following these indicators and focusing solely on price action, I can ignore all the big news items each day. All I care about is what the price of the stock, or the market in general, is telling me to do. If price action tells me to sell, we still have to sell regardless of what the big picture says. And this isn’t just a hard concept for technicians to grasp. It’s one of the sticking points for investors as well. If you are overly optimistic, a bear market is going to crush your portfolio. And if you are overly bearish, then you are not making enough money from the extended bull market. Earlier this year, when the S&P 500 Index went through that sharp correction, I was along for the ride. My investing strategies were already in place to keep thriving through a turbulent market. But I also analyzed the broader market trends in price action to have a general idea on what will happen next. To determine that, I tracked a chart of the S&P 500 with three key moving averages — its 200-day moving average (red), 50-day moving average (green) and centered 50-day moving average (orange). The price action was telling me to buy the dip, and that’s exactly what I told you all to do as well. 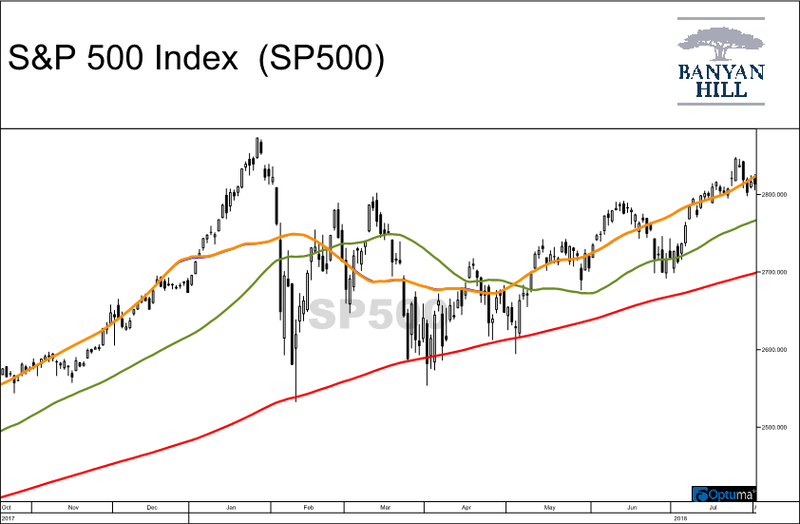 The pullback brought the S&P 500 right to its 200-day moving average. Stocks then quickly bounced higher. That was great to see. From there, the trend in the market was higher lows bouncing off the rising 200-day moving average line. Then, in late April, we see the orange line cross above the green line. This tells me this isn’t the start of the next big crash, and it was an excellent time to jump in. During this period, the news didn’t faze me one way or the other. I simply followed price. And at the end of the day, we are making money. Right now, markets are near all-time highs. That’s an extremely bullish signal. The price is telling us, regardless of tariff impacts, that this is a continued bull market you want to be invested in.